I just uploaded the newest Assasin moth pics from Devin to foilermoth. Like always you can download them if you want to. When I look at those pics I am craving even more for my Assassin. 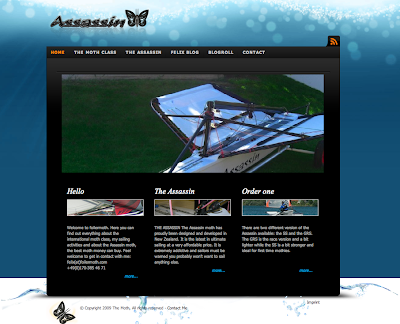 The goal was to put enough information on there to make people that are new to the moth curious about this wonderful boat while also advertising my new job as an Assassin reseller for central Europe. In addition I also wanted to share more information about my sailing life and thus incorporated my private blog on foilermoth as well. I still have got lots of plans for foilermoth.com and thus we will put out new features every time we can spare some time at studdex. One of the first features we added is a picture gallery. I have added all the pics from Kieler Woche 2008 and also added a download button so you can finally have them all. Also if you have got additional moth pics from regattas just send them to me and we will put them on http://foilermoth.com/pics.html so everyone can download them. Now the situation is as follows: the 4 weeks without a license only start when the Führerscheinstelle has received my driver’s license and I am also not allowed to drive right now as I do not have a license. So now I have to order a new license, pay 85€ for it, pick it up, hand it to the Führerscheinstelle and wait for 4 more weeks till I can get it back. Thus by noq I expect to be without a license until middle of August. Awesome, isn’t it? You are currently browsing the foilermoth blog archives for July, 2009.